The first annual conference of the Cold Pressure Council (CPC) took place last year with attendees from all over the world. Around 150 attendees from more than 75 companies, research groups and regulatory entities joined this event to discuss about HPP best practices, market trends, food safety subjects and more. We previously covered the entire event and if you wish to see some topics and information that was shared, check out our previous blog article “Hiperbaric participates in the cold pressure council (CPC) annual conference”. Some highlights included the presentation from one of our own PhD candidate Mario Gonzalez-Angulo. His presentation was entitled “Validation of HPP coconut water for Clostridium botulinum” The presentation was equally well received by industry members and his peers. The CPC has been non-stop with multiple achievements, like the launch of the “High Pressure Certified” logo, expansion in Europe and more. Therefore, this year’s agenda is more global and with a long list of relevant topics about High Pressure Processing. Join us for networking at the Keith House, a distinct 1870’s mansion, in the heart of the renowned Prairie Avenue Historic District. Only three blocks away from McCormick Place and 10 min from downtown Chicago. 8:30 am – 9:15 am – “HPP Continues to Create Value for the RTE Meat Industry”. Speaker: Lee Johnson, Vice President, Technical Services of West Liberty Foods will discuss HPP success with Meats. 9:15 am – 10:00 am – “HPP use for Seafood”. Speaker: Robert Verge, Managing Director, Canadian Centre for Fisheries Innovation. Seafood is an established HPP market segment, Robert will discuss challenges they met as they integrated HPP with a system for automatically extracting meat. This includes process parameters, testing with crab that have different characteristics and resulting business success. #1 “My Company Journey from Idea to High Pressure Processing Certified Launch”. Speaker: Yanni Hufnagel, Founder and CEO. Yanni will share his company’s steps to retail success including the launch of Lemon Perfect products with the High Pressure Certified Mark. 1:30 pm – 2:15 pm – “HPP Delivers the Taste; a Developing Country Perspective”. Speaker: David Blanks, Director and Owner Avolands. David will present on the breadth of High Pressure Processing usage globally, plus the insight on operating a business with different perspective than in the United States. 2:15 pm – 3:00 pm – “The Value of Trust marks for consumers in the Food and Beverage Category”. Speaker: David Bloom, Principal, Factotem Inc. David Bloom will share the value of trust marks for consumers; you will learn how this information can be applied to the use of the new High Pressure Certified mark. 3:15 pm – 4:00 pm – “CPC Annual Meeting Session”. Speaker: Joyce Longfield, VP of Innovation, Good Foods Group and Cold Pressure Council Chairperson. This is the official meeting for the association. All attendees are welcome to attend. 4:00 pm – Networking Reception / Hosted by ProFood Tech. All CPC Annual Conference attendees are invited to attend this reception. 9:15 am – 10:00 am – “CBD Success in the U.S Market”. Speaker: Jacob Freepons, Co-Founder of Lumen. Lumens developed and released a CBD Elixir for the U.S market that utilizes HPP. Jacob will share his company’s use of HPP to deliver a product available to a national audience. #1 “Clean Label Products – Opportunities and Challenges Using High Pressure Technologies”. Speaker: Dr. V.M (Bala) Balasubramaniam, Prfessor, Food Engineering, Ohio State University and Editor-in Chief, Journal of Food Process Engineering. Dr. Bala is one of the founding members of the IFT Nonthermal Processing Division and teaches courses on principles of thermal and nonthermal processing. Dr. Bala has authored over 125 works on nonthermal food processing methods and will discuss how HPP can assist in promoting clean labeling in packaging. #1 “HPP Success Drives Business Growth in South Africa”. Speaker: Willie Brand, CEO, High Pressure Processing South Africa. Willie Brand will share insights on the growth of HPP in South Africa, working with local authorities and more. Learn about global HPP utilization and how international business operates under different regulations. #2 “Automation and HPP – Advanced business Metrics”. Speaker: Rick Marshall, President, Gridpath. Recent automation advancements merged with HPP can achieve more yield and more business results. 12:00 pm – Conference Concludes / Use your CPC Annual Conference badge for complementary admission to the ProFood Tech trade Exhibition in the West Building. 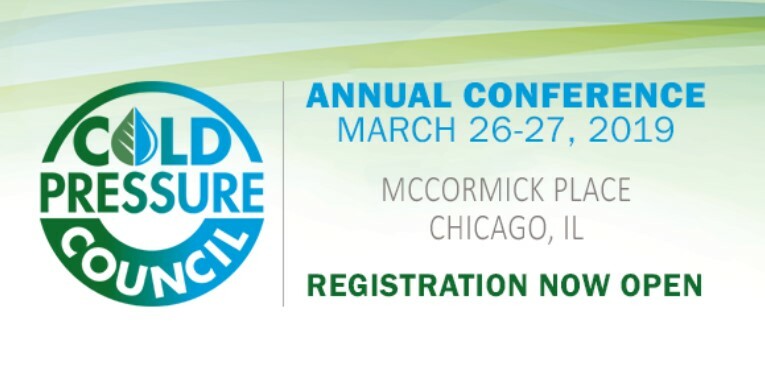 Registration is now open for the Cold Pressure Council’s Annual Conference; you can register by clicking here. What else can you expect from the Cold Pressure Council in 2019? The efforts from the CPC have been nonstop since its beginning. We are also on the works on expanding the CPC over to Europe so stay tuned in our newsletter for more news in regard to memberships and more. If you wish to see all products that are currently verified using the High Pressure Certified logo click here. To check the guidelines and see if your product is eligible please visit the Cold Pressure Council and the High Pressure Certified website. 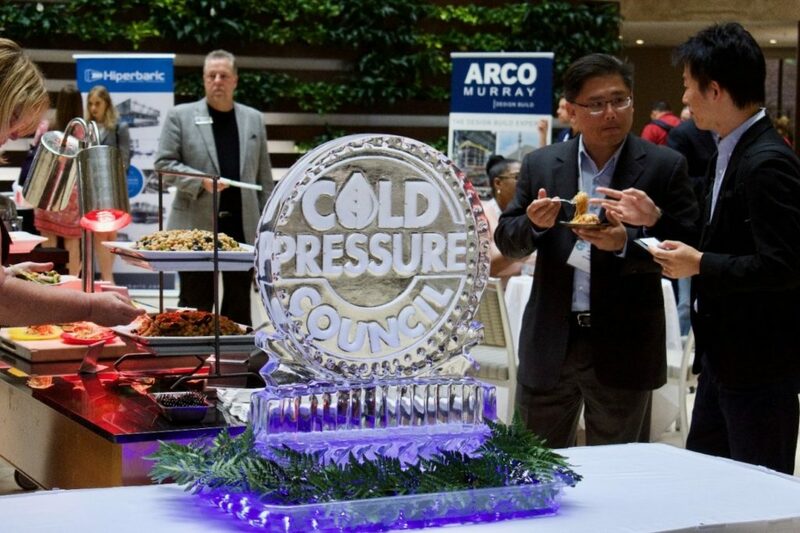 With a growing membership of over 30 companies, the Cold Pressure Council leads, facilitates and promotes industry standardization, user education and consumer awareness of HPP. One vote per company for Cold Pressure Council Board members and other actions requiring membership vote per bylaws. Two complementary registrations to the Cold Pressure Council Annual Meeting. As worldwide HPP manufacturing leader and one of the founding members, Hiperbaric is thrilled to take part for a second time in the CPC event. Hiperbaric will continue participating actively within the Cold Pressure Council, and is already looking forward to take part in the second Annual Conference this upcoming March. If you wish to learn more about HPP, meet our team at the CPC Annual Conference do not hesitate to contact us.